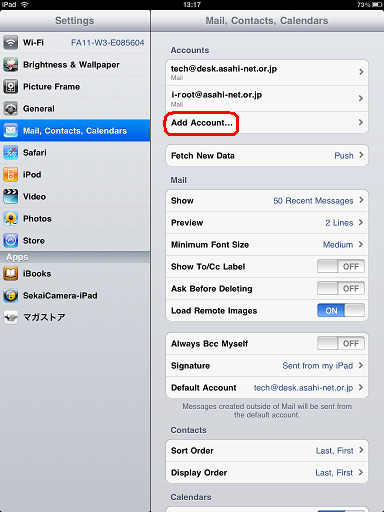 The examples on this page show how to add a mail account and how to delete a mail account using an iPad. If other mail accounts are present the wizard will bring up additional windows that are not shown in this guide. 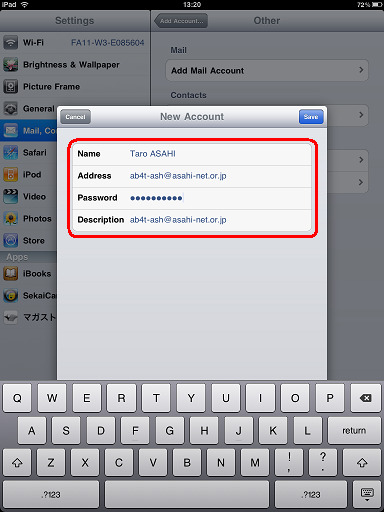 This guide is based on iPad OS 3.2.
ab4t-ash is used as the example User ID in this guide, ab4t-ash@asahi-net.or.jp is used as the example email address. 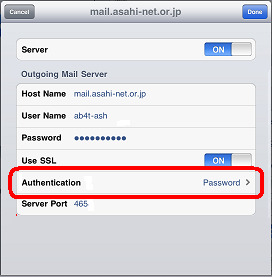 Please enter your own Asahi Net User ID and email address when making a mail account. 1. From the Home screen of your iPad, tap on Settings. 2. 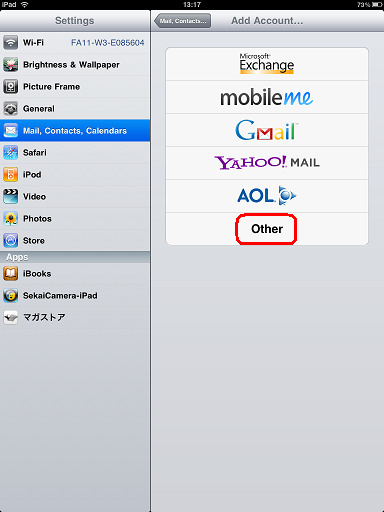 From the Mail, Contacts, Calendars menu, tap Add Account. 3. From the Add Account menu, tap Other. 4. From the Other menu, tap Add Mail Account. 6. When finished, tap the Save button. 8. When finished, tap Save. Confirmation of the Host Name is then done automatically. 9. 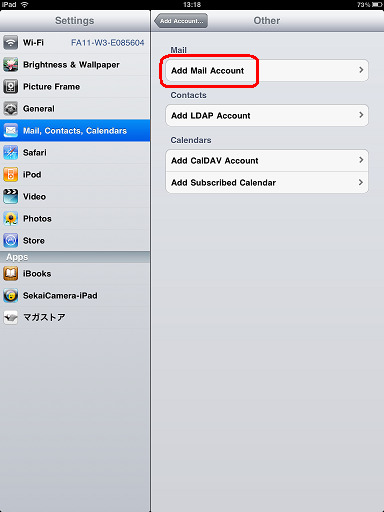 From the Mail, Contacts, Calendars menu, tap on the newly created account in the Account section, (e.g. ab4t-ash@asahi-net.or.jp). 10. 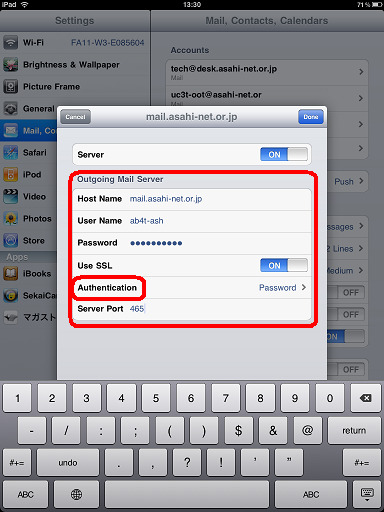 Scroll down and tap SMTP in the Outgoing Mail Server section. 11. 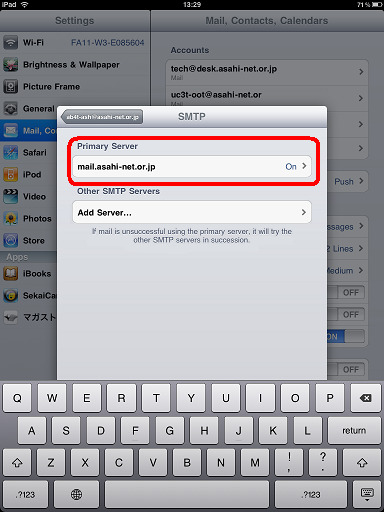 From the SMTP menu, tap on Primary Server. * If you will use another provider's server, please confirm the server name with that provider. 13. To change the authentication type, tap on Authentication. 14. 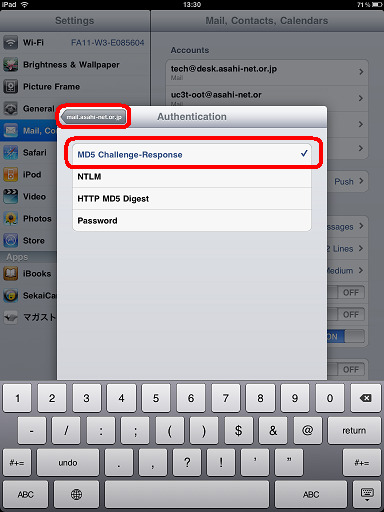 In the Authentication window, tap on MD5 Challenge-Response to check it. 15. Tap the mail .. Back button. 16. Tap the Done button. 17. Tap the ab4t... Back button. 18. In the account window, scroll down and tap on the Advanced button. 20. Tap the ab4t... Back button. 21. The settings are now complete. 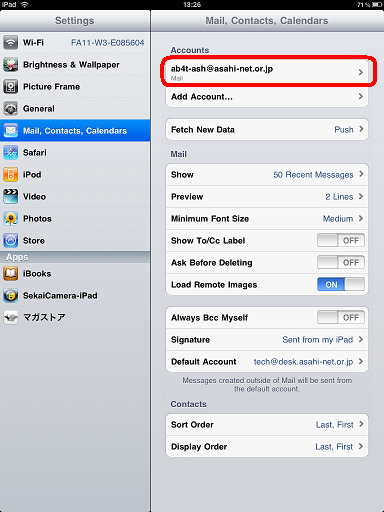 Please return to the Home screen of your iPad using the iPad Home button, and then check your account settings by sending yourself an email. 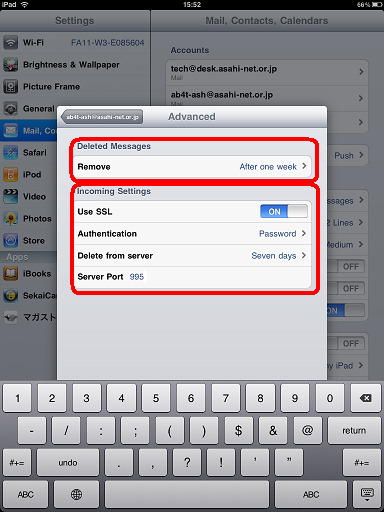 In the course of setting up and using your iPad, you may want to delete an unwanted mail account. If you delete a mail account all email that was received with the account will also be deleted. 22. From the Home screen of your iPad, choose Settings. 23. In Mail, Contacts, Calendars, choose the account you want to delete. 24. Tap on the Delete Account button. 25. 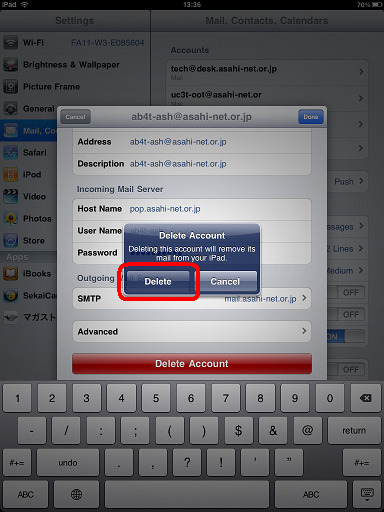 Confirm you want to delete the account by tapping the Delete button. 26. The account will be deleted. 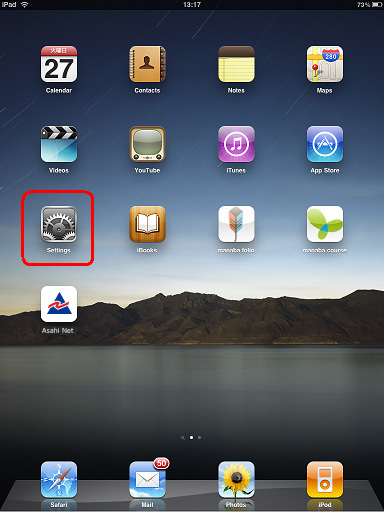 Return to the Home screen of your iPad using the iPad Home button. 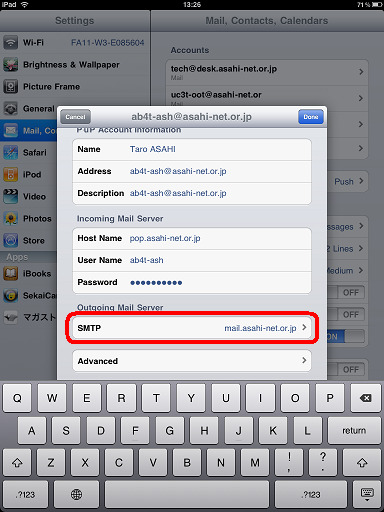 Thank you for visiting the [Mail configuration for iPad] page of Asahi Net, the Internet provider.